Like many professional, single 20-somethings, my friends are some of the most important people in my life. Just because I don't have a boyfriend, that doesn't mean I shouldn't celebrate important milestones with the people I love. Facebook's "On This Day" feature shows you what you and your friends posted on a specific day over the years you've used the site. Until now, there hasn't been an easy way to celebrate a friendship anniversary. When you're dating someone, you remember your first date because it was on your calendar, you'd spoken to friends about it, or you made a point to remember it because it felt special. People generally don't remember the first time meeting their friends. Whether they met at work, school or at a party, meeting someone who will eventually become a close friend isn't always memorable. Thanks to Facebook, I now have a date to remember when my friendships started. 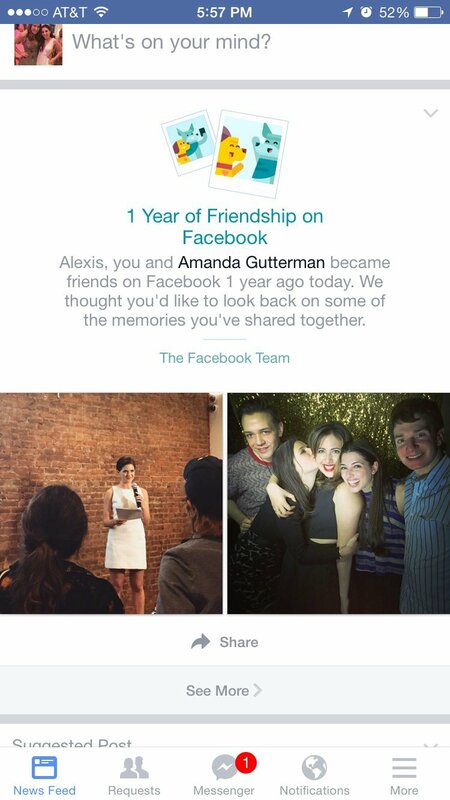 A few weeks ago, I got a notification that I had been Facebook friends with my friend Amanda Gutterman for a year. We worked together at The Huffington Post when we first met. Since we're both so obsessed with the Internet, I can't imagine that too much time passed between us meeting IRL and becoming friends on Facebook. Since we first met, my friendship with Amanda has blossomed through exchanged glances at work, frantic Gchats, text messages of all varieties, brunches and exercise classes. We share everything from our deepest fears to our favorite chocolate chip cookies (from Birdbath Bakery). I'm more bonded with Amanda (and with many of my other close friends) than I ever have been with a romantic partner. So when Facebook gave me the heads up that we had been friends for a year, Amanda and I decided to celebrate. We did so last weekend, the best way we know how: brunch. There's been a lot of talk lately about the importance of female friendships. The New York Times' Emily Witt asks if it's healthy for women to be so publicly preoccupied with their friendships. "I used to think that friendship as performed for an audience would end with middle school, but the past 10 years of technology have changed that expectation," Witt writes. "In social media ... it becomes a presentation of happiness, an advertisement for friendship rather than an actual portrayal of it." While I agree with Witt that social media can seemingly take the sincerity out of relationships and experiences, just because I'm posting smiling photos of my friends and me at parties doesn't mean we aren't also crying and fighting and sharing the deepest parts of ourselves offline. My friends, like everyone else's, keep me grounded, make me laugh and make me reexamine my life every day. And now, we can celebrate together every year.